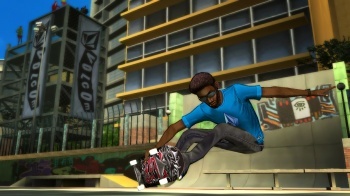 The latest installment in the once-mighty Tony Hawk series has launched not with a bang, but with a pathetic, pathetic whimper. The Tony Hawk skateboarding games were once some of the most popular sports titles around back in the halcyon days of Pro Skater 3. In fact, there was a time when a new Tony Hawk title would have been a guaranteed hit, much like the annual Madden or Call of Duty releases are today. Those days are evidently far behind us. According to the monthly NPD numbers for October, Tony Hawk Shred - the followup to the rather poor Tony Hawk Ride - sold a dismal 3,000 units across the Wii, PS3 and Xbox 360 in North America during its first week of sales. That is an absolute abysmal launch for any game, especially a game in a series that once had such high brand-name recognition. To put this in perspective: Another Activision title, DJ Hero 2, was described as having a "disappointing" launch, selling a meager 59,000 copies in the second half of October. Even taking into account that this includes two weeks of sales rather than Tony Hawk's one, DJ Hero 2's "disappointing" release still outsold the skateboarding title ten to one. That isn't just a disappointing launch, it's a thoroughly humiliating one. Is it any wonder, then, that developer Robomodo was hit with layoffs? I mean, for crying out loud, guys - Nokia's original N-Gage sold more than that on its debut. When you're being outsold by the infamous side-talking taco, there is a serious, serious problem.